Portugal are now one step closer to the EURO 2016 finals, after visiting and beating Albania 0-1, thanks to a late header from Miguel Veloso. The Portuguese National Team lead Group I with 15 points, 3 more than Denmark and 4 more than Albania. It was another tough win for the Portuguese National Team, who despite having won their last 5 fixtures in the EURO 2016 qualifying Group I, are yet to beat any of their opponents with a goal margin higher than 1. Nevertheless, each of those wins still earned them the desired 3 points and the truth is that Portugal are now one of the few teams in Europe already in the pole position to make it to the EURO 2016 finals, next summer in France. Portugal dominated the first half in Elbasan this Friday night, creating a couple good chances to break the deadlock before half-time, while at the same time they also managed to control Albania's attacking intents without much hassle. Their best scoring chance happened in the 13th minute, when a corner kick taken by Danny was deflected in the near post just before meeting Nani on the far post. The former Manchester United winger only had time to react by instinct and hit the woodwork, which allowed Albania to keep dreaming about a positive result this Monday night. The game would open up in the second half, with both the hosts and the visitors uninterested in settling for a draw. Albania were very close to score in the 75th minute when a good strike from Cikalleshi slammed against Rui Patrício's post. 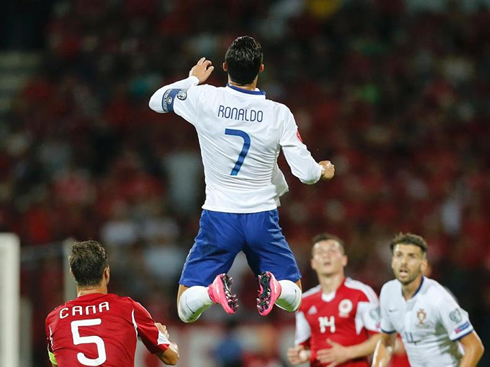 Portugal responded just 5 minutes later, when Ronaldo assisted Eliseu for a 1-on-1 chance against Albania's goalkeeper, but the left-back failed to hit the target in a miscalculated lob. As time ran off the clock, the goalless draw appeared to be the most likely result. It wouldn't be a bad result for any of these two teams either, since Denmark had already tied against Armenia 0-0 earlier on. However, Portugal still had one word left to say in this game and they would finally break the deadlock 2 minutes inside stoppage time. Ricardo Quaresma took the corner kick on the right, curled the ball into the heart of the box and saw Miguel Veloso heading it cleanly and into the back of the net to put Portugal on the driving seat. It was a very complicated win for Fernando Santos' men, but these 3 points already allow the "Selecção" to start dreaming with France and the EURO 2016. Attackers: Nani, Danny, Cristiano Ronaldo. Cristiano Ronaldo next game will be for Real Madrid, on September 12 of 2015, against Espanyol. You can watch Juventus live stream, Espanyol vs Real Madrid, Macedonia vs Spain, England vs Switerzland, USA vs Brazil, and Russia vs Sweden, all matches provided from our soccer live game pages.